- Strong suction shower head holder: Maximum load of 4.5 lb. - Waterproof: This shower head holder can be used anywhere you want to place your hand held shower head. - Easy Installation showerhead holder: No drilling, no screws. The suction shower bracket holder is self-adhesive in just one minute. 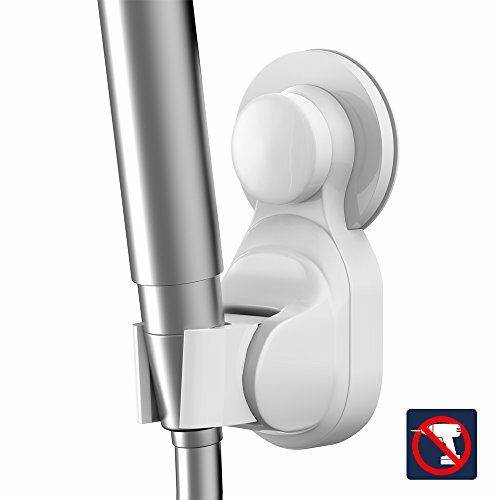 - Wide scope of application: Suction cup showerhead bracket stick great on smooth, non-porous surfaces, such as metal, glass, mirror, window, polished stainless steel wall, ceramic tile and granite etc. 4. Then you can use this suction showerhead holder to organize your hand held shower head/ bidet sprayer .